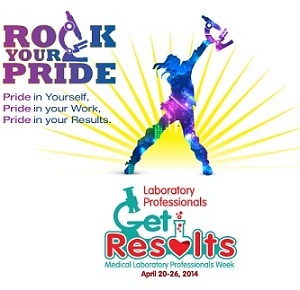 Medical Laboratory Professionals Week is April 20-26, 2014. The UCLA Department of Pathology and Laboratory Medicine recognizes and commends the dedication and commitment of laboratory professionals and pathologists who are so critical in the diagnoses and prevention of disease. More than 300,000 medical laboratory professionals around the country perform and interpret more than 10 billion laboratory tests in the US every year. Here at UCLA, medical laboratory professionals in clinical care, research, and education are redefining and informing the quality and standards of personalized medicine and essential, life-saving patient care. Celebrated annually, Medical Laboratory Professionals Week is a festive opportunity for camaraderie and fellowship.